Make this lovely block in a traditional setting or more modern approach. Using either a ruler if you have one or a template will bring this block together easily. Can easily be translated to a simple cushion cover or if you like you can then go on to make more blocks to make into a full quilt. Bring your own choice of fabric. Machine sewn, to speed up the process, still giving a lovely finish. 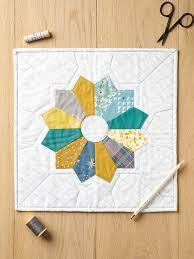 Craft/quilting cotton to make your block. we supply the sewing machines.